I'm ecstatic. I've been through, and this team has been through, so many tough times since I've been here, but this team, these guys just have never quit. The passion that the Boston fans have is so great. I'm just glad we had the opportunity to do this for them.  Wakefield's first win of the season came against the Yankees on April 16. In a game of personal and team redemption, Wake limited the Yankees to one earned run on four hits in seven innings, in the two teams' first meeting since the dramatic 2003 ALCS.  He had back-to-back starts in which he gave up no earned runs, 6 1/3 innings in New York on June 30 and 7 innings against Oakland on July 6.  Tim went 5-1 in August, including a strange start in Detroit in which he gave up six home runs but still got the win. Later in the month, on August 29, he matched two of his his season-highs at home against the Tigers, with eight innings of work and seven strikeouts in a 6-1 Sox win.  Wakefield pitched in relief twice, volunteering to give up his starts to keep the rest of the rotation in order after a series of rainouts. He allowed no earned runs in a total of three innings in those games.  Tim was slated to start Game 4 of the Division Series against the Angels, but with the Sox' three-game sweep he didn't get a chance to pitch in that series.  In the ALCS, he was again scheduled for a Game 4 start. But when Bronson Arroyo was knocked out of Game 3 after only two innings and the relievers were taking a beating in the game the Sox would go on to lose 19-8, he sacrificed his chance to start Game 4 and volunteered to "take one for the team." He ended up pitching 3 1/3 innings in Game 3, allowing Terry Francona to keep the rest of the bullpen rested. 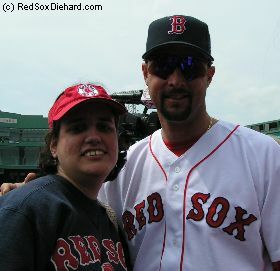 Keith Foulke and Mike Timlin didn't have to pitch at all that day, and Alan Embree faced only four batters. When the next two games of the series went extra innings, it was crucial to have rested relievers, and Francona and his Red Sox teammates were quick to point out that without Wake's selfless act, the comeback would not have been possible.  Wakefield entered Game 5 in the twelfth inning with the teams locked in a 4-4 tie. His knuckleball had been effective against the Yankees in the past, and this game was no exception. He wound up throwing three scoreless innings, and picked up the win when David Ortiz hit the game-winning single in the bottom of the fourteenth.  Wake was finally rewarded with a chance to start, and it was no less than Game 1 of the World Series. He went 3 2/3 innings and gave up five runs, but left with a 7-5 lead in a game the Sox would go on to win 11-9. He's the heart and soul of this team, of this pitching staff. All the battles he's fought through here... he never turns down the ball. He asked for the ball in Game 3, when he volunteered to come down to the pen. He's just a great, great player on this team. This page and all photos copyright © 2005-2009 by Kristen D. Cornette.